Twenty-one people were killed by Israeli airstrikes Monday in Syria. The dead reportedly including 12 members of the Iranian Revolutionary Guard. The latest round of attacks between Israel and Iran began with a series of Israeli airstrikes Sunday on Iranian targets in Syria, attacks that have become almost routine. But this time the missile strikes took place during the day and Israeli officials openly took responsibility for them. Israel usually neither confirms nor denies these strikes. Iran’s retaliation came a few hours later with a surface to surface missile fired at the Golan Heights, which includes Israel’s only ski resort. That missile was intercepted and shot down by the Iron Dome system. There were no casualties but Israeli army officials said if it had landed it could have killed dozens of people. Israel responded to the Iranian missile launch with a widespread attack in Syria that killed 21 people. FILE - Israeli Prime Minister Benjamin Netanyahu speaks at the Israeli Air Force pilots' graduation ceremony at Hatzerim air base in southern Israel, Dec. 26, 2018. 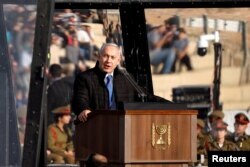 Israel’s Prime Minister Benjamin Netanyahu said Israel will not allow Iran to establish a foothold in Syria. "Israel will continue to block Iran's efforts to use Syria Lebanon and Gaza as forward bases for attacking Israel for the express purpose which they openly declare — destroying Israel," Netanyahu said. The British-based Syrian Observatory for Human Rights reported 12 of the dead in Israel's retaliatory strike were members of Iran’s Revolutionary Guard, which could increase tensions between Israel and Iran even further. In the past Russia and the United States have acted to calm tensions between Israel and Iran. But now neither side appears willing to intervene, especially after President Donald Trump announced he is pulling all American troops out of Syria. A senior Iranian official said his country will continue to be involved in Syria as long as the Syrian government asks for its help. FILE - An Arrow 3 anti-missile interceptor, jointly developed by the Israeli and U.S. governments, is test-fired from central Israel on Feb. 19, 2018. Meanwhile, Israel says it has carried out a successful test of its Arrow 3 Missile Defense System, developed in cooperation with the United States. A pioneer of the Arrow system, Uzi Rubin, says the Arrow 3 will increase Israel’s defense significantly. "This is meant to work against Iranian missiles than can fly for thousands of miles," said Rubin. "It is the first defense these missiles will meet."